THIS EPISODE IS BROUGHT TO YOU BY LIMINAL APPAREL. IT'S THE 2ND SHOW IN A MINI-SERIES EXPLORING THE THEME OF MODERN SLAVERY IN FASHION SUPPLY CHAINS. DON'T MISS THE OTHER 2! If only all fashion was fair trade fashion. According to the Global Slavery Index 2018, fashion is one of 5 key industries implicated in modern slavery. In Australia, every year we import over $US4 billion worth of clothes and accessories at risk of being tainted by modern slavery. 40 million people globally are trapped in it, and 71 % are women. In this Episode, we hear from ethical fashion pioneer Safia Minney. The founder of People Tree is now heading up fair trade shoe brand Po-zu. She appears in The True Cost. She's an MBE, an activist, and has spoken more than once at the World Economic Forum's meetings in Davos. Safia is the author of 4 books, including her latest, Slave to Fashion. Slave-free fashion is achievable, says Safia. Indeed fashion can be used to empower workers. We discuss how, the challenges and joys of working this way, how she started out - way before ethical fashion was *a thing, and what makes her heart sing these days. Liminal Apparel are makers of excellent fair trade totes, tees, aprons, and other 'blank' apparel. They say: "Our apparel and bags are made under fair trade working conditions, and we only use sustainable or organic materials. We’re serious about bettering the lives of our producers, so we also re-invest all profits back to the communities that create our products. Our products are the perfect blank slate for you to apply your own ideas and designs to. By using Liminal Apparel, you’re also making a statement of commitment to a fairer world." Liminal made these bags for Safia's Slave to Fashion project. 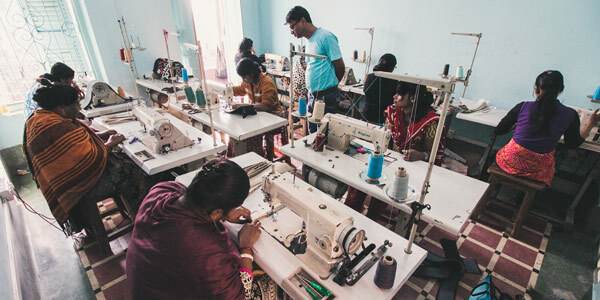 They work with the NGO Freeset to produce out of India, giving fair work opportunities to women formerly, or at risk of being, trapped in bonded labour and human trafficking. Freeset is accredited as Fair Trade Guaranteed by the WFTO. Read more here. All Liminal's cotton is certified by Fairtrade Labelling Organisations International (FLO), and comes from Chetna Organic, a farmer-run cooperative in India. It's organically farmed and GM free, to benefit the soil, cotton and farmers. Crops are rain-fed and hand-picked. Organic farming is achieved through companion planting, crop rotations and on-site green waste composting to eliminate the use of chemicals harmful to farmers and their families. Cotton is a sustainable, recyclable and biodegradable fibre. Read more here. WHAT IS FAIR TRADE? "Fair Trade is a trading partnership, based on dialogue, transparency and respect, that seeks greater equity in international trade. It contributes to sustainable development by offering better trading conditions to, and securing the rights of, marginalised producers and workers – especially in the South. Fair Trade organisations have a clear commitment to Fair Trade as the principal core of their mission. They, backed by consumers, are engaged actively in supporting producers, awareness raising and in campaigning for changes in the rules and practice of conventional international trade." Via WFTO. Originally, the aim was self-development of producers; gradually the objective became guarantee against exploitation. Read about the history of the fair trade movement here. The WORLD FAIR TRADE ORGANISATION is a global network of organisations representing the Fair Trade supply chain. People Tree is a WFTO member. WFTO'S 10 STANDARDS. 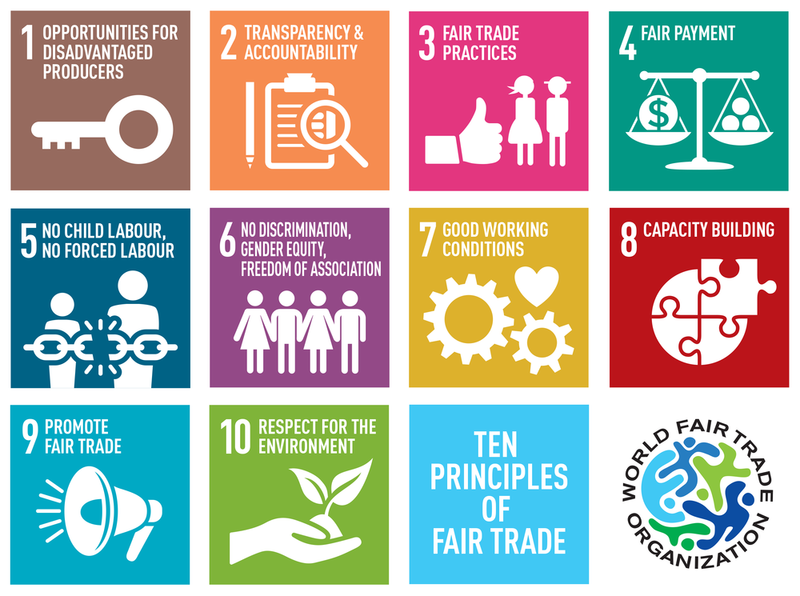 There are 10 Principles that Fair Trade Organisations must follow in their day-to-day work and carries out monitoring to ensure these principles are upheld. Further reading here. FAIR TRADE PREMIUMS. Paid over and above the minimum fair trade price, premiums are additional sums of money that go into a communal fund for workers and farmers to use as they see fit; to improve their social, economic and environmental conditions. PEOPLE TREE is a pioneer in eco & ethical fashion, founded by Safia in 1991. For over 25 years, the company has partnered with Fair Trade producers, garment workers, artisans and farmers in the developing world to produce collections. Safia stepped down as chief executive at People Tree in 2015, but continues to be a non-executive director. They say: "Good for people and the planet. We work with Fair Trade ethical producers from across the globe to create striking designs." The company developed the first integrated supply chain for organic cotton from farm to final product and we were the first organisation anywhere to achieve GOTS (Global Organic Textile Standard) certification on a supply chain entirely in the developing world. PO-ZU. Safia now runs this ethical shoe & sneaker brand out of London. They use screen-printed, organic cotton uppers, fair trade rubber and natural coir (as a foot mattress). Po-zu launched the Better Shoes Foundation in 2016, as "a bold step towards a blueprint for a whole new footwear industry - one that is good for consumers, workers, and the environment. WHY DO WE NEED BETTER SHOES? * Less than 5% of waste from post consumer shoes is recycled. * Just 2% of the final price of a shoe goes to the workers who made it. * 85% of the world’s leather is tanned using chromium, which is considered to be the fourth worst pollutant in the world. Talking of ethical sneakers, have you listened to Episode 38 with Veja? ON AVERAGE 3 PAIRS OF SHOES PER PERSON END UP IN LANDFILL EVERY YEAR. SLOW FASHION. What does it mean? "The first thing is that we have to start managing our operations and our supply chains better, to know that we don't have slavery within our supply chains. To know that we're not polluting or using cruel methods of manufacture or highly toxic methods of manufacture in using different chemicals with finishes right the way from the pesticides to the methods we use for transportation. We need to slow the process down. As consumers, it offers us a chance to actually think about: What do we really want to wear? What makes us feel good? It unlocks a huge power within ourselves, but it also gives us a huge opportunity to add value to [the producing] communities. To grow cotton without pesticides, insecticides and herbicides means we're going to save farmers between 9% and 12% on their production costs; it means that we can use indigenous seeds that are GMO free; it means we're going to put fertility back in the soil, so rather than being 0.3% of live matter - in a conventional field it will be as hard as tarmac - if you go into an organic cotton field it's very spongy and fantastic because it's got 3% live matter in it. There's so many different levels that by slowing it down, by paying a little bit more attention to the provenance of the product that we're buying, asking the questions in store, maybe choosing not to buy new; buying vintage or second hand or asking your mum or a best friend if they'll lend you a dress. There's a real opportunity here to look at how we do fashion and living differently. And I think if we look [ethical fashion] concept stores, they're a beautiful celebration of real texture and fantastic fibres and things that actually make us feel a lot better, not just about the environment." Via i-D. Read Safia's full interview here. THE TRUE COST is a 2015 documentary film about ethical fashion by Andrew Morgan. You've probably seen it, right? TRIPLE BOTTOM LINE ECONOMICS. The concept broadens a business' focus on the financial bottom line to include social and environmental considerations. A triple bottom line measures a company's degree of social responsibility, its economic value and its environmental impact. The SUSTAINABLE ANGLE is a London-based not-for-profit organisation that initiates and supports projects which contribute to minimising the environmental impact of the fashion industry. The Body Shop was, of course, founded by Anita Roddick. OFFSET WAREHOUSE is a is a social business that sources eco fabrics and sustainably produced haberdashery. Quantities from one metre. In Australia, you can find deadstock at Fabric Store. SLAVE TO FASHION is a book and campaign produced to raise awareness of modern slavery in the fashion industry and shows how it can be eradicated by business and us as consumers. Check it out here. The BENETTON PROTESTS happened in London on the first year anniversary of Rana Plaza. "PROTESTERS chained their necks and hands to the doors of Benetton's Oxford Circus shop ... Flyers that were handed out to passers-by explained the protesters actions: 'One year ago today on 24 April 2013, Rana Plaza - a garment factory in Bangladesh - collapsed killing 1,134 people and injuring over 2,500," read the flyers. "Amongst the rubble, piles of Benetton labels were found, yet despite this, the Italian clothes company have refused to pay any compensation to the people killed and their families." Via British VOGUE. SWALLOWS Development Society is a women's group of 200 artisans ranging from weavers to tailors, based in Northern Bangladesh and supported by People Tree. "We've taken them to visit other tailoring units and even bought some of their producers over to the UK to meet customers," Safia explained to the Guardian ten years ago. "In rural Bangladesh it's hard for people to understand fully what the average 32 year old in London wants to wear, how she lives. They've learned why fitted clothes are important, and seen how fashion retail looks in London – quite different, obviously, to Bangladesh. It has given them the tools to really become part of the fashion industry and to feel that they are very much in control of the traditional process. That is what's really important." In 2011, Safia took Emma Watson to Swallows. The actor modelled for & endorsed a fair trade capsule collection for the brand.